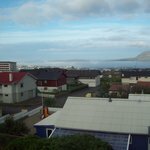 Our room 221 was lovely and clean, comfy bed, warm, great views over Torshavn, heated floor in bathroom, a minibar, free wifi, free parking and breakfast included. Arriving Faroe Islands by Atlantic Airways we rented a car at the Vagar airport. There is breakfast included in the rate (basic, but pretty standard for the Faroes I think), as well as free wifi. In fact it is 2 minutes walk from the harbour where Smyril line ships arrive and 5 minutes walk from the old Tinganes city centre. Get quick answers from Undir Fjalli staff and past guests.